I burned up my drive belt and can't get the clutch off. The engine is all bound up due to belt winding getting jammed in between the clutch and engine block. I removed the outer portion of the primary clutch and the secondary, but I can not get the inner portion of the clutch loose from the crankshaft. FYI I am not using a puller. Is there a way to get the clutch part off the crank? Anyone gone through this before? I am concerned I have damaged my crankshaft seals with the belt winding. Thank you in advance my doo friends! That water method is thought to be the best BTW. 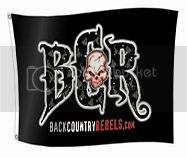 Welcome to BCR sorry your first post is because of something like this, Sounds bad. When you say you are not using a puller, what exactly do you mean? You DO have the Doo puller/bolt right? You aren't trying to pry it of from behind are you? Give a little more background if you could, it'll help us help you! Generally, if your motor seems bound up from the belt chords wrapping around the crank then yes, most likely you'll need to replace the crank seal... Sorry. It would also help if we new where you are so if any of us are local to you then we could at the very least loan you a puller if you don't have one but DON'T pry on the backside of the clutch, if you did then I'm afraid that's toast. If you don't have the correct puller, do the water methode like stated on the dootalk link. You will need teflon tape (any hardware store or auto parts will have it). Take your time, it will come off. If the seal is bad, besure to get the mag side as well. You will be in for some special tools to get the flywheel off. Can rent those from auto parts places for cheap. Thanks for jumping in to help. I did do the water method w/snow in the field last week and yes it popped the clutch off no problem, but it's only the outer half. It's the shaft and collar, inside portion of primary, that I now need to remove from the engine crankshaft. I have tried the water meathod bit it's not getting it. I tried the grease.... no go. Keep in mind the belt winding was jammed in between the clutch and engine block. I am using the bolt the holds the clutch oon the crank. Not using the washer and not installing the outer half of the clutch; the bolt bottoms out. Yes, i did pry a little... with tools from the kit after the front half came off... i was desperate to not spend the night. I think snowmobile riding is a mental game... when the belt blew I found myself seperated from my riding buddies for several hours. They got me out by about 8:00pm. Wife's sled 014 800 163 with E Start. Mine 012 800 Pro 155. Family sled 99 Tundra and a 96 Indy Sport. Don't get me wrong but it sounds like to me you are threading it into the crank. The bolt should thread into the clutch shaft and stop threading and slid in further to start in the crack. are you sure you are not threading it past the threads in the shaft? Correct, The bolt that holds the clutch into place will not pull the clutch. I have the puller here, basically consists of a longer bolt with a non threaded shaft where the clutch bolt has threads. The threads that are on it thread into the clutch part that is still on the crank and as you tighten it, it pushes against the end of the crank and pops the clutch off. Any Doo dealer will have one for under $30. I hope you didn't deflect the sheave at all when you pried on it but I understand the feeling you had when separated.. Not a good feeling. Did you use teflon tape on the threads of the bolt? If not, the water will leak by the threads. Did you use enough water? DO NOT PRY ON THE CLUTCH. You will break some expensive stuff. The first part that the bolt threads into is the clutch. If you thread past the first set of threads you are into the crank and are making the connection tighter. Last edited by Mac-Daddy-Racing-212; 12-21-2011 at 11:17 AM.